Let's Do An Engine Swap! So you want to do an engine swap in something that was never offered with it. -Make sure the vehicle is at finished ride height and rake. It also needs to be level. Remember that the engine is going to make the front of your hotrod go down when you finally drop it in, so plan ahead. You somehow need to mimic the weight of the engine (500-600 pounds)with some kind of weight on the frame, or transfer the engine weight to the frame (like setting the engine on the crossmember with a piece of wood). Keep the engine hooked to a lift, though. It may sound silly, but people that have guessed at how much the engine swap will bring down the front have ended up with the front of their hotrod too high, or too low. -The body needs to be on the frame so you know where the firewall will be. The front doghouse can be off, unless the width of the motor or hood clearance will be an issue. -Have the radiator mounted on the core support or where it needs to go. -Have the water pump installed on the engine. -Know what fan you are going to use so you can plan the clearance. -Exhaust manifolds or headers may be in the same space as the steering box and shaft. You will want all the steering parts in the car and what exhaust manifolds you want to use so you can plan the positioning of the engine. Also, if you will be running rack and pinion steering, you will want the rack installed. Often they can be slightly above the crossmember. So, you will want to plan for oilpan clearance. -You usually need to set the motor and trans in as a unit. You may have to modify the firewall or the floor to get enough clearance for them to set where they need to be. -Level it up... You will want the carb as level as you can. By doing so, you will tilt the engine/trans unit down in the back by about 3 degrees. The carb mounting pad on the intake is already tilted for this. 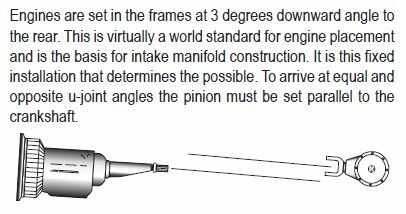 So, when the pad is level, the engine/trans unit is just about right for the u-joint angle. Also, you want the engine level side to side. You also want the engine centered in the engine bay (Usually). However, sometimes it's necessary to move the engine over in the engine bay for clearance. Don't worry, the major automakers have been doing it for years... Mopar, as an example, used to have many of their engines moved over an inch or two towards the passenger side for clearance. Basically you want the end of the transmission pointing down about 2-3 degrees. You took care of that by leveling your carb. You want your pinion on your rear axle to be pointing up by about 2-3 degrees. If the rear end is stock, it's probably there already. If you need to adjust it, they make shims to rotate it. Ok, now that we have the engine/trans setting where we want it, we have to make mounts to finish our engine swap.